A friend of mine was traveling in Myanmar. It reminded me of an episode on Anthony Bourdain’s Parts Unknown on CNN a few years back. I learned from the TV show and my friend that Burmese are big fans of eating salad. They would have them first thing in the morning and throughout the day. I was immediately drawn to the salad-for-breakfast idea, because in most countries in Asia, having salad in the morning is actually quite an unusual event. I remembered that whole30 folks also encourage people to include salad in the morning so I modified this chopped salad for those of you who are looking for something a little more interesting than the usual salad dressing with olive oil and balsamic vinegar…etc. My recipe below uses fish sauce to represent the original style and taste of the Burmese. If you aren’t a big fan of fish sauce, replace it with coconut aminos for a milder taste. The ingredients are very simple – chopped spinach and tomato with crispy shallots. I strongly encourage you not to skip crunchy shallots as it is a crucial ingredient that makes this salad stand out from others. 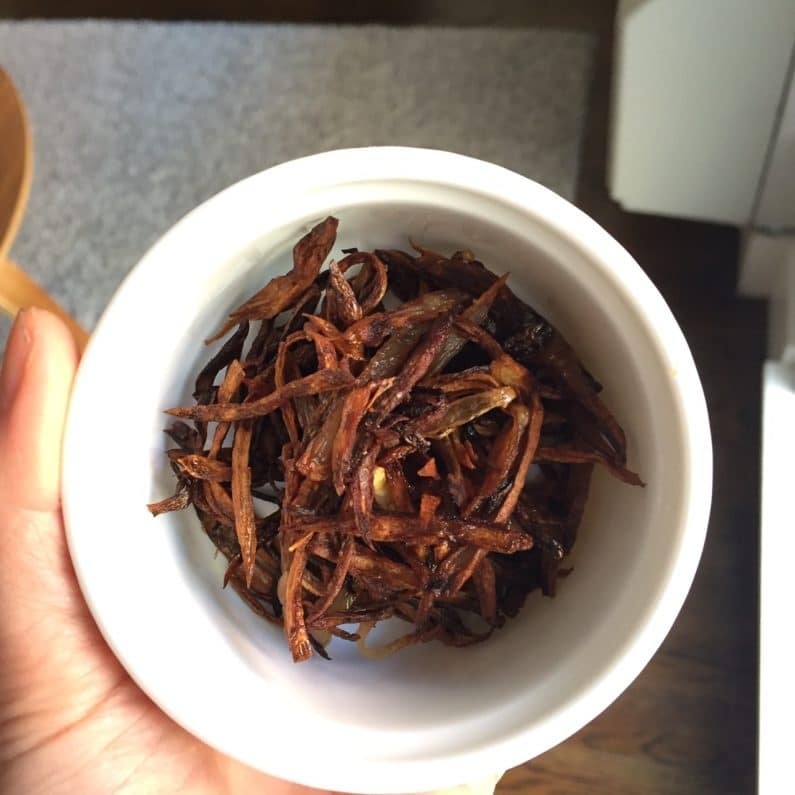 You can prepare the ingredients a day before – even fried shallots – and store them in separate containers. When you are ready, mix all of them together for a quick and refreshing Burmese bite. Are you trying to incorporate more salad into your diet? What’s your favorite way to prepare salad ? Leave a comment below. I’d love to try yours too ! Slice one large sized (or 2 medium sized) shallot into thin slices. Heat a saute pan or a wok with 4 tbsp coconut oil over medium high heat. When hot, turn the heat down to medium, add sliced shallots. Add a small pinch of salt. Continue stirring and moving shallots with a wooden spoon until golden brown, about 4-5 minutes. Separate crispy fried shallots and oil. Set aside for later use. Mix well all ingredients under “dressing”. Toss everything together with 1 tbsp of shallot oil and fried shallots. Enjoy the salad alone or as side dish. If you want, add a fried egg for extra yum ! 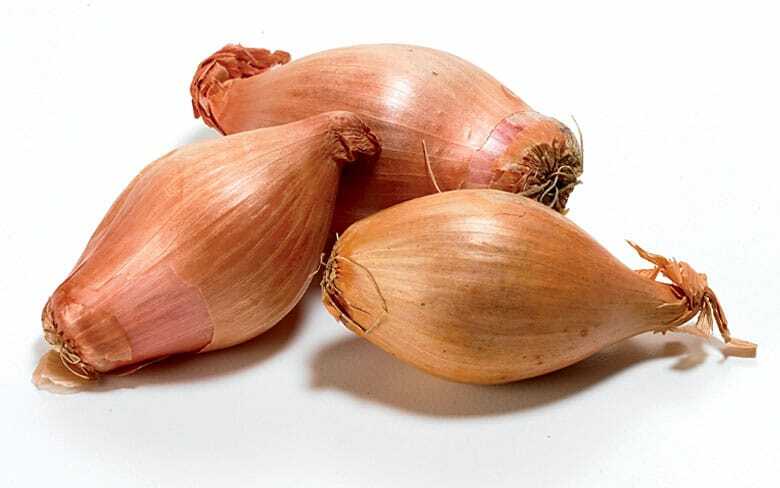 Shallot is a type of onion but has a sweeter and milder flavor than onion. Here’s a pic of them. Also, since shallots are smaller, with more fine layers than onions, make a point to chop onions into smaller pieces when using them in place of shallots. Here’s a great article from the kitchn, talking about shallots and onions. I hope this helps ! Ok, yes we have those and they are shallots as I know them. Thanks for replying and clearing it up for me. Looking at the photo of the dish, I confused myself as the fried bits look long, but I guess that’s how you cut them. I will do the same. Can’t wait. Thanks again. Makes me think of the famous salad at Burma Superstar in San Francisco. Have you been there? Mind blowing!